Israel carried out a drone raid on a convoy south of the Sudanese capital last month, foreign intelligence sources say. Israel carried out an unmanned drone raid on a convoy south of the Sudanese capital, Khartoum, last month, foreign intelligence sources told the Reuters news agency on Thursday. The sources claimed the strike destroyed 200 tons of munitions, including rockets, that were intended for Gaza. The report comes one day after a huge fire broke out at an arms factory in Khartoum. 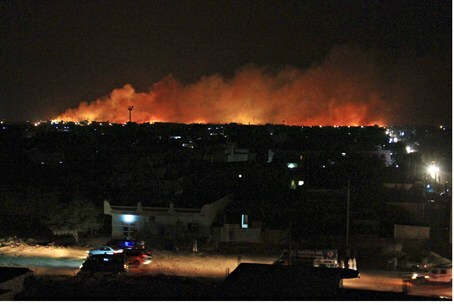 Sudan said the fire was a result of an attack by four military planes. The country’s Culture and Information Minister blamed Israel for the attack, adding that evidence pointing to Israel was found among remnants of the explosives. The country’s envoy to the UN later demanded that the UN Security Council condemn Israel over the attack on the weapons factory. The envoy, Daffa-Alla Elhag Ali Osman, also accused Israel of involvement in the Darfur conflict. One retired Israeli defense official told Reuters on Thursday that Israel has been monitoring arms trafficking through Sudan, adding that the monitoring dates back to the previous government of Prime Minister Ehud Olmert. "This is all the more relevant today," the ex-official said, referring to the instability in Egypt and in the Sinai Peninsula. Israel did not officially comment on Wednesday’s incident, but Amos Gilad, director of policy and political-military affairs at the Defense Ministry, said Thursday that Sudan was a terrorist state. Hitting back at Sudan over its blaming Israel, he said that its accusations that Israel engaged in terrorism against that country could not be taken seriously. Prime Minister Binyamin Netanyahu would not comment on the incident, saying at a news conference on Thursday that Israel had nothing to say about the explosion. In May, Sudan suggested that Israel was involved in an explosion that killed a suspected arms smuggler in the eastern Sudanese city of Port Sudan. Last December, news outlets in Sudan claimed that Israeli fighter jets, helicopters and possibly a submarine were involved in multiple attacks on targets in the country.